How on earth did someone let this sit in the vault for 30 years? Don't worry: it was worth the wait! 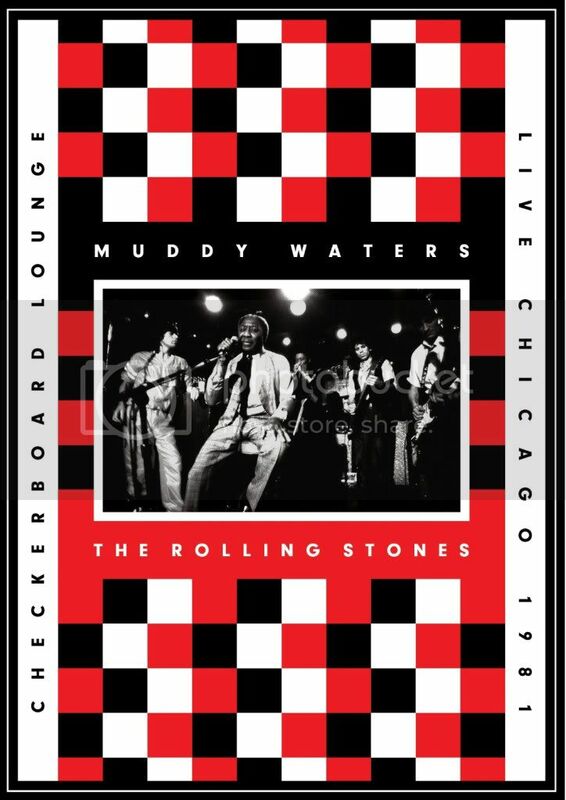 The first thing I asked myself before I saw or heard a note of Muddy Waters & The Rolling Stones' performance at Chicago's Checkerboard Lounge was how the blue hell had this been left unreleased for more than 30 years? Something like this doesn't even have to be good to merit a release and if it is actually good, you'd have to be crazy to let this sit on a shelf. Talk about a self-fulfilling prophecy. If you're in the business of selling music, how do you not at least try to sell this? Before we consider the presence of Mick Jagger, Keith Richards, Ronnie Wood, and the forgotten Stone Ian Stewart, let's consider just the blues royalty captured onstage this special night on Chicago's South side. We have one of the faces on the Mt. 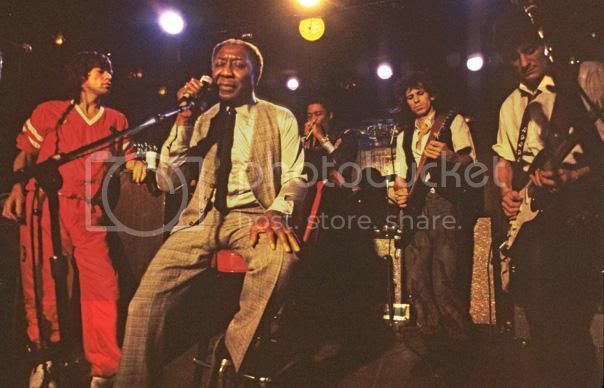 Rushmore of the blues, Muddy Waters. We also have Hall of Famers Buddy Guy (Rock & Roll and Blues) and Junior Wells in the house and the great Lefty Dizz. Blues lovers -- and there are plenty of us -- would have flocked to this, Stones or no Stones. The Mud isn't at the height of his powers, this show roughly two years before his passing, but his presence is commanding, voice in strong shape, and still possessed of a few potent licks in his guitar. There isn't a great deal of video footage of The Mud performing and I keep coming back to the question: why the hell did we have to wait so long to see and hear this? The show opens with Waters' band doing a few numbers before joined by their leader, a tradition of Muddy's band throughout the years. We are treated to a few numbers with them all onstage before The Stones enter The Checkerboard Lounge. They look like they came to join a packed but small house to hear one of their heroes perform but this is 1981 and there was nowhere on earth these guys could make an inconspicuous entrance. They may or may not have planned on playing but Waters was having none of it, quickly calling Mick Jagger to the stage to sing with him on "Baby Please Don't Go." Jagger finishes a verse and then Muddy starts calling for Keith, who was on his first glass of bourbon (at least as far as what's captured on video). Richards climbs the tables and ambles his way to the stage -- this place was tiny -- finds a guitar, and joins the increasingly packed stage. The presence of these global superstars is, in some ways, a distraction to the great blues moments this show offers but it also gives a glimpse at an easily forgotten part of the Stones legacy. Their band name comes from a Muddy Waters song. They really did form as a band who loved the great sounds of Chicago and the heroes of Chess Records like Waters, Howlin' Wolf, and many others of that era. No matter what they became and regardless of what blues purists think of them, they never lost their love of what brought them together in the first place. Seeing a band who could sell out a football stadium anywhere in the world at the time and still can playing in a tiny club is itself a rare and historic moment. We see Jagger swagger and preen to no one in particular, likely oblivious to any recording equipment in the room. He's moving because that's who he is and what the music does to him. Keith and Ronnie stand off to the stage and later in the background, playing the blues because the music is still in their blood, despite all the trappings of the rock and roll lifestyle they embraced to excess. They aren't rock and roll stars tonight; they're musicians. Guy, Wells, and Dizz come to the stage next and it's pretty amazing to think this is a glimpse of what Chicago could be like in the glory days of the blues: on any given night, you could catch any of these guys at a different club and before it was over, they could be sharing the stage somewhere completely different. Oh to be able to go back in time…! Junior Wells was a badass and we get to see some of that in action. He had a unique presence and much too bold and confident to just blend in. He's a joy to behold even as we see years of hard living already catching up to him. Guy embodies powerful doses of extroverted showman and shy humility tonight (something true of him from his beginnings and to this day as he continues working well into his 70s). He reveres Waters to this day and whether or not he thought he could, it wouldn't occur to him to try upstaging The Mud. The room is swinging and everyone is having a great time and Waters and Jagger leave the stage to Guy, Dizz, Wells, Richards, Wood, and the rest. Their magnetic presence is missed -- particularly Waters -- but the party is now in full swing and there is plenty of firepower to keep things swinging until the two frontmen return to close the show with a roaring version of "Champagne & Reefer" (a song The Stones would play with Guy at The Beacon, captured in Martin Scorsese's film Shine A Light). There are only a few quibbles with this package worth mentioning, the first being the sound. The quality of it is actually excellent- maybe even a little too good. Bob Clearmountain mixed and mastered the tapes and it feels too bright and clear at times, especially contrasted with the grainy footage of the DVD. It's great to hear the music sound good but at times it feels too clean, cleaner than it probably was for the audience listening as it happened. The other issue is the presence of more music on the DVD than the CD. This is common with these kind of multimedia packages where a DVD holds more information than a compact disc. For nerds like me, it would be great to have the full show available in audio and video. Neither of these should discourage anyone from jumping at the opportunity to experience a special night when the stars aligned and legends shared a stage, listening to each other and playing together and having a hell of a time doing it. Not everything sitting in a vault somewhere should be released but it's maddening to wonder what other magical moments could be on our shelves rather than forgotten in a box in someone's closet. Live At The Checkerboard Lounge was worth the wait but it's tragic we had to wait for it at all.